Made it back to Kentville. We actually didn’t see any rain yesterday, so perhaps the weather is changing. But, it was still overcast all day. We did another walk around Lunenburg before we left. The elementary school is interesting, and it is still in use today. It’s a very distinctive looking building and can be seen from many angles around Lunenburg. Lunenburg Anglican Church. This church was badly damaged by fire in 2001, but was restored in 2005. 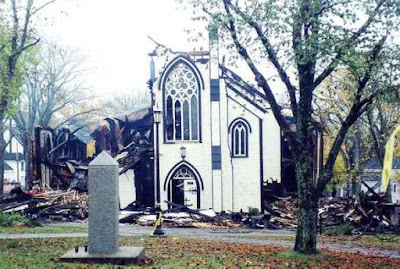 Here's a pic I found online of the fire in 2001. Then we walked to the opposite side of the harbor to get a better photo of downtown, but it would look so much nicer with a blue sky! There is a lot more to see in the area, so we will return one day this summer. After lunch, we drove back to Kentville. Had a great prime rib roast for dinner, made in the motorhome with roast potatoes and Yorkshire pudding. Spent the night at the church next door to Lindsey and Justin’s, and today we’re going to head up to Gaspereau Mountain where Sherman will be parked up for the next three weeks or so. Thanks for all the anniversary wishes! You may have noticed that Blogger had a problem today, and that's why our daily post is so late. And, our post from yesterday has disappeared! We have a copy of it so that we can put it back if Blogger doesn't, but we'll wait to see what happens. We like Blogger, and this is the first time there's ever been a problem for us. Besides, Blogger is owned by Google, and it's Google Adsense that is starting to contribute a noticeable amount of monthly income towards our travels! So although there are other options, we'll continue using Blogger for the foreseeable future! Such a beautiful area Lunenburg, definitely worth a return visit. Love the roast beef and Yorkshire pudding same as we had yesterday. We had the same problem with Blogger as well, first time since 2006 and our Wednesday post was restored as they had promised. George and Suzie...They did restore the missing post but not the comments. Oh well, it's better than losing everything. We always keep a copy, just in case.